When it comes to Swiss watches, Fortis is a brand that’s not likely on everyone’s radar. Founded in 1912, Fortis is a Swiss watch manufacturer that’s been around for a while but it’s a brand that’s nowhere as popular as Rolex and Omega. However, that doesn’t mean that Fortis watches don’t deserve the attention. Fortis earlier collections have really made a mark in the market, most notably the Fortis Cosmonaut and B42 lines. For today’s Fortis watch review, we’ll take an in-depth look at the Fortis Aviatis Pilot Classic Chronograph. Does this Fortis watch have done enough to separate itself from the competition? Let’s find out. 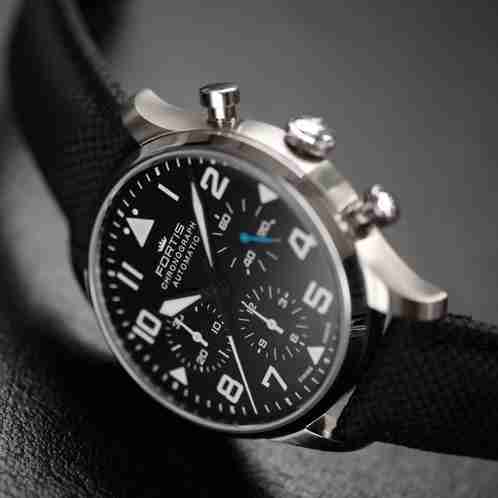 Should You Get the Fortis Aviatis Pilot Classic Chronograph? The best pilot watch is about having bold, easy-to-read displays and high-quality construction. 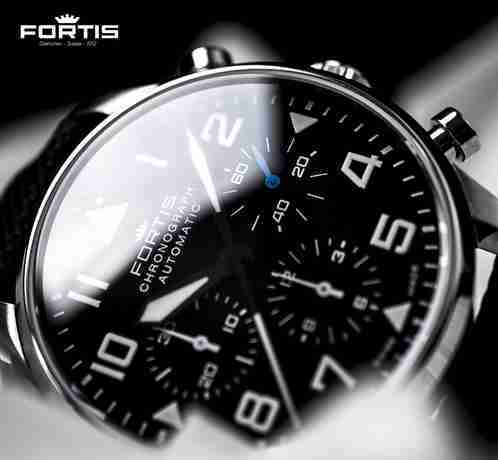 From the looks of it, Fortis is on the right track with the Fortis Aviatis Pilot Classic Chronograph. Before we get into the meat of this Fortis watch review, let’s first check out the key specs and features of the Aviatis Pilot Classic. The Aviatis Pilot Classic Chronograph is part of the Pilot Classic collection of 40mm and 41mm models. If you have been keeping tabs with Fortis, you’ll be quite familiar with the Pilot Classic Date. Just last year, Fortis released the Cockpit Classic Second which features a design based on the earlier models of Fortis. Anyway, the Aviatis Pilot Classic Chronograph has a design that simple but effective, just the way I like it when it comes to pilot watches. It comes with a thin case that gives off an impression of elegance. The watch really you that feeling that it’s small in looks but big in stature. At first glance, the dial looks a bit quite busy but with further inspection, I realize that it offers a thoughtful design. Like the best pilot watches in the market, the dial features large luminous numbers that are easy to read. The 41mm case with a 13.59mm thickness is just right and comes with both polished and brushed sections. While this may scream uncomfortable to many people, the watch actually sits comfortably on the wrist. However, the watch may feel too big for a user with a smaller wrist. The overall design of the Aviatis Pilot Classic Chronograph is unmistakably vintage which I am very fond of. I am always thrilled to see the screw-back of watches as it does a good job of telling a story. However, that doesn’t seem to be the case with Aviatis Pilot Classic’s screw-back. Most notably, the display back is not pressed in or screwed in. Instead, it’s just one solid steel and held together with 8 screws that are attached to the back of the watch. If you are expecting to learn much information about the watch, you’ll probably end up disappointed. At the back, there’s really not much going on back there. You’ll find the usual information like the reference, model name, serial numbers, and water resistance. It does have a see-through window that allows you to check out the ETA/Dubois-Depraz chronograph movement. For what it’s worth, I must say that the movement is well-designed. The crown and pushers are very well-polished and certainly completes the look of the back. The rotor displays the Fortis name and logo in blue. Overall, nothing too flashy back here but it gets the job done. Considering that the Aviatis Classic is a chronograph, it’s fair to expect that the dial will be quite busy. 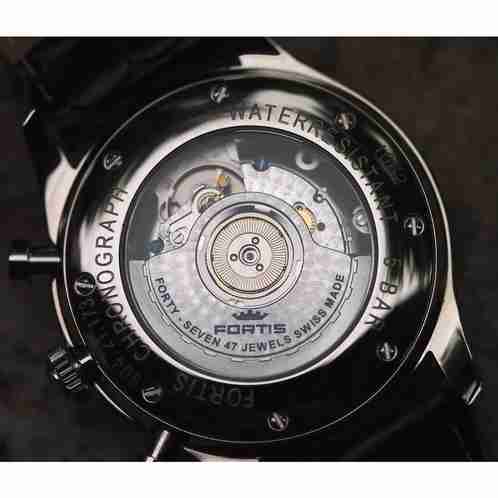 However, Fortis did a good job when it comes to the placement of the dial elements. The standout elements are definitely the large luminous numerals and the vintage-style Flieger hands. All the numerals are visible except for the 12, 3, 6, and 9. Instead, the 4 numerals are replaced with Flieger triangles, the largest of which on the 12 o’clock. Not sure if I’m a fan of this design decision but it does allow Fortis to include the subdials without cramping the space. Another thing that you’ll notice is that the seconds dial has blue hands which is an inspired design choice. The rest of the hands of the chronograph are all in white. At the 12 o’clock portion, you’ll see the “Fortis Chronograph Automatic” underneath the largest Flieger triangle. The overall design of the dial is quite similar to the case. It features a compelling balance of the vintage and modern. I was looking for some sort of depth within the dial but unfortunately, I failed. Perhaps the addition of stepped or recessed sub dials would have done the trick. As it is, it looks a bit too flat for my taste. 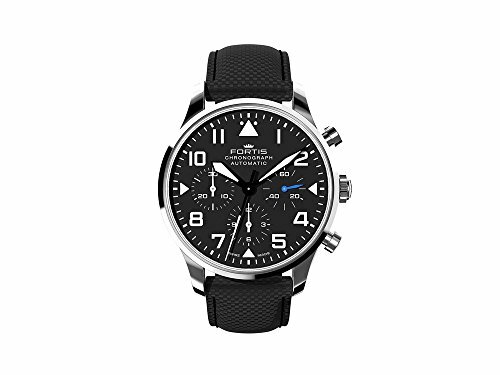 I’ve been doing my homework about this Fortis watch review and found out that their chronographs usually utilize the iconic ETA-7750 caliber which made me initially excited. 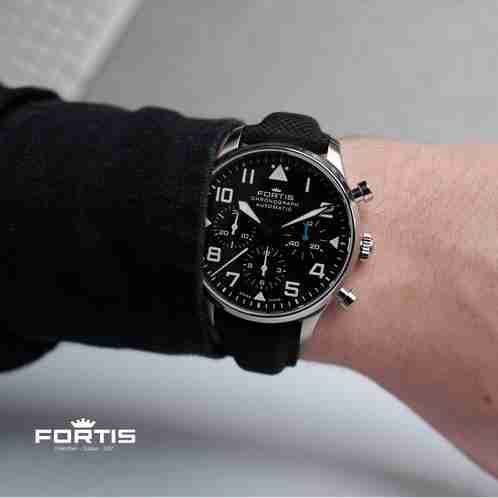 Unfortunately, it’s not applicable with the Fortis Aviatis Pilot Classic Chronograph. Instead, Fortis used the Swiss automatic movement ETA 2892 with Dubois Depraz 2020 module. For the uninitiated, this movement features the ETA base 2892 which is a time only caliber. The Swiss made, automatic chronograph movement is listed as a 47 jewel and it’s mainly due to the movement of the module. The movement comes with hacking seconds and a respectable 43 hours of power reserve. Fortis’ decision to place the module on top of the caliber makes for a rather dense movement. This explains why the thickness of the case is almost 14mm which might be too thick for some people. Nevertheless, I’ve experienced little to no problems while wearing the Aviatis Classic. Operating the pushers is a breeze although the bottom pusher seems to be tougher. One of the best things about the Fortis Aviatis Pilot Classic Chronograph is that it comes in three different types of straps. The watch can be worn with a black leather strap for dressier functions, and a NATO or performance leather for more rugged purposes. The black leather strap is about what you can expect from a standard leather strap. It’s a soft and plain leather strap with a good amount of padding. In terms of comfort, there’s nothing to complain about the black leather strap as I’ve experienced no significant comfort issues. Between the three straps, by far my favorite is the black performance leather strap. It feels more like a synthetic material than leather. However, we’re happy to report that it’s indeed leather and it’s actually made by Hirsch, a world-renowned Austrian strap maker. The strap has matching white stitching that gives it a high-quality look. The performance strap is also water resistant and I can see myself wearing it for outdoor activities. The NATO strap looks like your standard NATO but I’ve not worn it yet. All the three straps are fitted with a brushed steel pin buckle. When it comes to straps and such, I’m a firm advocate of less is more which is what exactly Fortis has done here. The Fortis Aviatis Pilot Classic Chronograph sits comfortably on my wrist. Despite the size and thickness of the case, the watch surprisingly doesn’t feel that weighty. Using both the black and performance leather straps, it never felt that the watch has weighed me down. There are times that I would feel the crown but it’s never a big deal at all. Despite the fairly sizable pushers, they’re never in the way at all. The thickness does make the watch more prone to kicks and bangs. Fortis did a tremendous job of making a large-dialed watch for legibility while keeping the dimensions to acceptably comfortable dimensions. As far as luxury Swiss watches go, Fortis is a brand that offers quality timepieces for a lesser price. 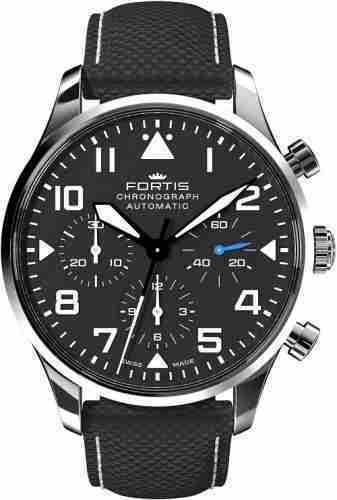 With the Fortis Aviatis Pilot Classic Chronograph, Fortis is offering a lot of watch for your money. If you are looking to have your mind blown away with top-of-the-line craftsmanship and sophisticated timekeeping features, this watch is not for you. However, for a price that won’t break the bank, the Aviatis Pilot Classic is a solid option in terms of construction, reliability, and features. It’s a very basic watch that meets the primary requirements for a good aviation timepiece. This wraps up our Fortis watch review. So, should you buy the Fortis Aviatis Pilot Classic Chronograph? If you are looking for a good quality aviation Swiss watch with no frills, it’s hard not to recommend the Aviatis Classic. After all, it’s a well-balanced package offered at a competitive price. With a number of strap options, it’s a fairly versatile watch that can be worn on many occasions. The black leather strap can be worn with a suit while the NATO or performance straps can be used for sportier activities. Despite its versatility, it never loses its identity as a pilot watch. This is a good watch the gets you sold to the Fortis brand.